The special was definitely something highly anticipated by viewers. It was a first in 16 & Pregnant history, with the show never having shown the option of abortion. 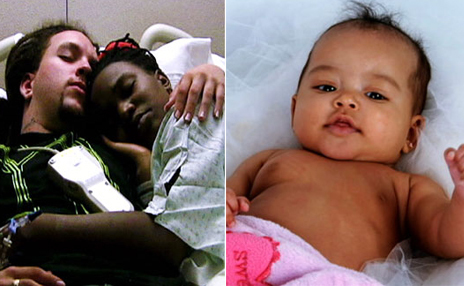 It began with showing Markai and James with their beautiful baby daughter Zakaria and their lives after 16 & Pregnant. They seemed to be living pretty well. The couple was living together with Zakaria in their own place and James had a job to support them all. Then the shocking news came that Markai was pregnant again. After talking with friends, her mom, and James, Markai made the difficult decision to abort the baby, realizing that she and James could not take care of this baby and Zakaria too. After the short 15 minute clip of her actual journey, Markai joined James and Dr. Drew, who has been the host of 16 & Pregnant’s reunion specials, in a discussion. Two other women who also made the choice to abort sat down and talked with Markai and Dr. Drew about why they made the decision to abort, stating that it is not as easy to abort as people may think. Markai wrote a note on her FB page earlier this week called “Open Your Eyes,” calling out all of her naysayers and defending her decision. “I never did it because I thought it was the right thing to do,” Markai wrote speaking of the abortion. “I did it because it was the BEST thing to do for my family.” The note further said that people should not judge her for her decision, and I agree. Coincidentally, I tweeted this yesterday, “Oh how quick we are to judge....u dont know what u would do in a situation until ur faced with it urself.” I am definitely pro-life, but I could not say what I would have done in this given situation. No one really can. Looking down on someone for their decisions is wrong and unnecessary. Another thing to see is that abortion, and really teen pregnancy in general, is a topic that needs to be openly discussed. The show has gotten a lot of heat from viewers saying that 16 &; Pregnant and Teen Mom glorifies teen pregnancy. I say, it puts EVERYTHING in the spotlight. The good, the bad, and the downright ugly. Money problems. School problems. Baby daddy and family drama. And actually BEING A MOM. It’s all a blessing, because beautiful babies have come out of it all, but being a mom period is no easy task. At 16 years old, it’s even harder. Though I don't condone teen pregnancy, I can respect them, and I actually look forward to watching more of them. Teen Mom 2 will premiere on MTV on January 11 of next year. New moms. New babies. New hardships. Watch the trailer below!